It's finally here. The weekend where we will see Radiohead. YES!!!! I can't really think about much else, but I have found a few pretty cool things around the blogs/web this week. Have a look! The most amazing Scandinavian log house. SWOON. How to put your kids to bed - and have them stay there. Must try these tips. The Style at Home ADOP giveaway closes today! Make sure you get your comment in! Soba noodles and veggies with spicy peanut sauce? YUM. Last minute Father's Day gift ideas. Really cute Neon/Wood bead DIY necklaces. 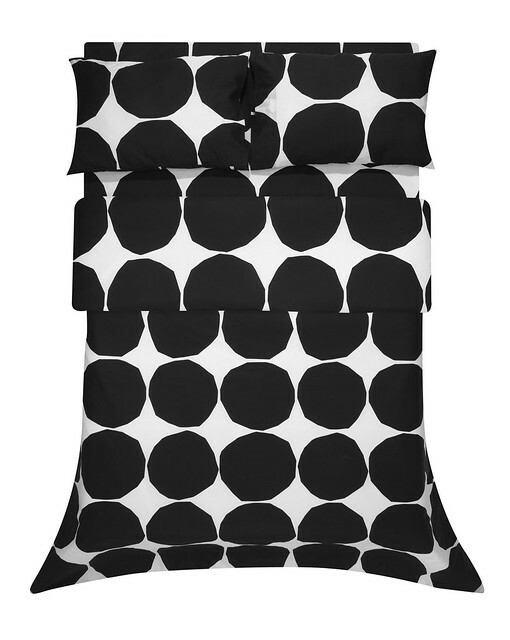 Can someone please buy me this Marimekko black and white duvet cover? Come on. Hope everyone has an amazing Father's Day weekend! love, love, love radiohead. it will be amazing. I can always pick out your pinterest pins even before seeing your name attached... my little black & white princess. I'm wishing, hoping & praying that I win this ADOP giveaway... please giveaway gods, pu-lease. Ha ha, I'm so boring! And I reallly hope you win too!!!! SO MUCH!! !